Home > Health Conditions > Allergies > Watch Out for These Weird and Rare Food Allergies! Today, it is common and expected to ask your dinner guests if you will need to accommodate them because of a food allergy. The nine most common food allergies include sesame seeds, tree nuts, soy, wheat, seafood (fish, crustaceans, and shellfish), sulfites, peanuts, milk, and eggs, with the last three leading to the majority of symptoms. While those nine are the big ones, it’s possible that you or someone you know has had severe reactions and are unable to pinpoint the culprit causing them. Have you ever heard of anyone suffering from one of the following uncommon food allergies? While this isn’t a very common food allergy, it affects up to 40% of adults that suffer from pollen allergies. Just when you thought it couldn’t get any worse with the scratchy, itchy, sneezy, sore throat symptoms during allergy seasons, you may also be affected by a syndrome called oral allergy syndrome. Hypersensitive individuals will experience symptoms such as tingling, irritation, swelling, itching, and burning of the lips, tongue, or palate. 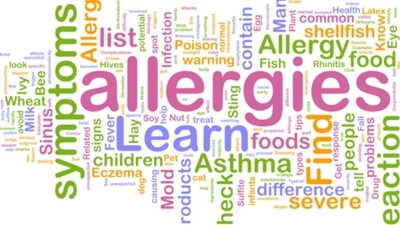 Most allergens are linked to your climate and geographical region. Specific fruits and vegetables should not be scrutinized. The food allergy is due to the cross contamination of the fruit or vegetable with pollen. People with pollen allergies are more sensitive to specific types of fruits and vegetables, therefore you should pay attention to which fruits or vegetables may set you off. Identify the specific fruits or vegetables that are causing your reactions and avoid them. Be aware that many of the immunogenic proteins that are causing the reaction cannot survive most cooking or processing treatments and therefore you may need to just avoid the raw food. You are likely able to tolerate cooked and canned fruits and vegetables while just avoiding the fresh ones. However, in one particular case study, a middle-aged woman was having severe irritation and swelling on her lips. She had a history of allergies during the summer months, and specifically tested positive to allergies for grass, mugwort, and ambrosia. Her skin prick test revealed that she was sensitive to raw broccoli. While many people have no adverse reactions to cooked broccoli, it was found that she, in fact, did. Some patients show symptoms to lipid transfer protein. After getting tested and determining that this is a food allergy you may be suffering from, it is important to completely avoid that food. Lipid transfer proteins are very stable, meaning they can withstand high temperatures including many cooking processes and aren’t broken down during digestion. In this case, it is recommended to completely avoid the raw and cooked variety of that food item. Another uncommon and evolving food allergy that is hard to diagnose is to a type of sugar rather than a protein. A compound called alpha-gal may present an immune response similar to an anaphylaxis reaction. The allergen is found in the red meat of beef, pork, and lamb but not in fish or poultry. One study of 24 patients with a delayed allergic reaction after ingesting red meat showed that 72% of them tested positive for beef extract in a skin prick test. After avoidance of red meat, 80% had no further reactions and others had fewer manifestations. Furthermore, most patients revealing a meat allergy have also reported a history of tick bites prior to their reactions. Tick bites are thought to induce increased sensitivity and can build up later reactions to those with the red meat allergy. However, the delayed reaction does make it difficult to diagnose this food allergy compared to most food allergies, which present an immediate reaction. Cross reactivity seems to be a culprit among many of these rare allergies. Avocados, bananas, chestnuts, and kiwis have presented adverse allergic reactions in up to half the people that suffer from a latex allergy. Some of these sufferers may show signs of sensitivity to apples, carrots, celery, melons, papaya, potatoes, tomatoes, or other fruits or vegetables. Many of the proteins found in latex can be structurally similar to the food proteins in these foods leading to severe allergic responses. Latex allergies are very rare as they only affect less than one percent of the general public, although they affect up to 20% of healthcare workers and up to 70% of people suffering from spina bifida, a congenital disorder resulting from a birth defect. Although latex allergies are life-threatening, the food reactions are less severe. However, since symptoms can occur within moments of food ingestion, these foods should be avoided until a doctor confirms your diagnosis. Since these food allergies are rare and difficult to diagnose, it is important to be aware of your body and how you react to different foods. If you suffer from any adverse symptoms, keep a food diary of any foods you’ve recently consumed and contact your physician immediately. Have I missed any rare food allergies that you or someone you know may have?